Lisa attended college after school completing a Diploma in Animal Management. 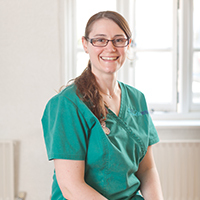 After finishing her college course in 2004 she found an advertisement for a Trainee Nurse position at Boness Vets and has been with us ever since. She has qualified to be a trainee nurse assessor and has completed many courses in the field including minor surgery and dentistry. Most recently Lisa has achieved an OCNYHR Level 4 Diploma In The Principles of Companion Animal Behaviour and Training. Outside of work Lisa enjoys spending time with her pets and carrying out charity work for both human and animal charities including hand rearing puppies and kittens. She has four cats, Dexter, Morgan, Oodles and Noodles. They were all hand reared for the RSPCA and ended up staying with her.